Whether you’re taking a family vacation during the holidays or simply visiting family nearby, you always want to be sure that you have a secure home. Here are some home security holiday travel tips to make sure that no grinches ruin your holly jolly holiday. Ask a trusted friend or neighbor to house sit or at least alert them that you will be traveling. Ask if they can stop by periodically just to check on your home. Make sure that your security system is updated and let your alarm company know you’ll be out of town. Provide them with your emergency contact number as well as the number of trusted friend or neighbor who will be checking in on your home. Let your local authorities know you’ll be out of town and ask if a cruiser can periodically patrol your neighborhood. Arrange for newspaper and mail delivery to be suspended while you are out of town. Lock doors and windows, repair any cracks around entryways, and use bars for extra security on sliding doors. Set the pin lock on garage door if it opens by remote. Make your home appear occupied. Leave a car parked in the drive or ask a friend or neighbor to park in your drive from time to time. Use automatic light timers for indoor lamps and outside holiday lights—alternate lighting pattern. If you’re leaving after Christmas, discard any signs of expensive gifts such as boxes from televisions, gaming systems, or computers. Conceal valuables so that they’re out of sight from the windows. Don’t keep spare keys in obvious places such as fake rocks or under flower pots. Leave curtains and shades open or partially open as they would be if you were home. Mow lawn or arrange for it to be mowed while you’re gone so that your home doesn’t appear unoccupied. Trim trees and hedges so that potential burglars have fewer places to hide. Consider upgrading outdoor lights with devices that feature built-in motion detectors and will turn on the lights whenever anyone walks past. 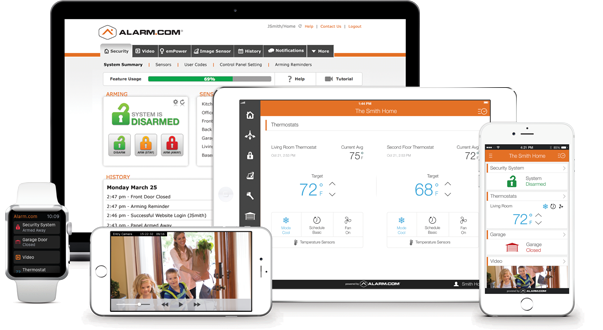 Remember, the best way to keep your home safe during the holidays and any time is with a home security system. Make sure to arm it EVERY time you leave your home.